One of the world's most successful astronomy observatories, CSIRO's Australia Telescope Compact Array near Narrabri, New South Wales (NSW), turns 25 years of age on 2 September. CSIRO will celebrate with a public Open Day at the telescope site on 1 September, then a formal ceremony and a scientific meeting. The Compact Array is a set of six dishes that work together as one much larger radio telescope. It lies between the towns of Narrabri and Wee Waa in northwest NSW, about 500 km from Sydney, at CSIRO's Paul Wild Observatory. Black holes, exploding stars, magnetic fields in space, galaxies at the edge of the observable universe: the Compact Array studies them all. The universe is a huge natural laboratory and astronomers study it to observe nature at its most extreme. "Every possible experiment is being played out somewhere in the universe," said Dr. Jamie Stevens, CSIRO's Senior Systems Scientist for the Compact Array. The Compact Array has given us the first 3D picture of the radiation belts around Jupiter, the first good evidence linking exploding stars with flashes of gamma rays, and the first image showing how gas churns in interstellar space. The telescope is so sensitive that it would see a mobile phone on the Moon as a very strong radio source. It can be pointed with an accuracy of better than two arcseconds—about the width of a finger seen one kilometer away. The Compact Array is to astronomy what the Australian swimming team is to sport: a world-class achiever for many years. It is among the top three telescopes of its kind by both publication numbers and citations. After the race, it would be standing on the podium! About 500 scientists from around the world use the telescope each year. The telescope has become better and better over time, as upgrades have made it more sensitive to faint radio signals and allowed it to capture more of the radio spectrum. In 2012 Compact Array data led to 76 refereed science papers—more than in any previous year of the telescope's history. "I never tire of observing with the Compact Array," Dr. Stevens said. "It's a factory for discovery." The telescope was funded as a project for Australia's Bicentennial in 1988, and was opened by the then Prime Minister, Bob Hawke. 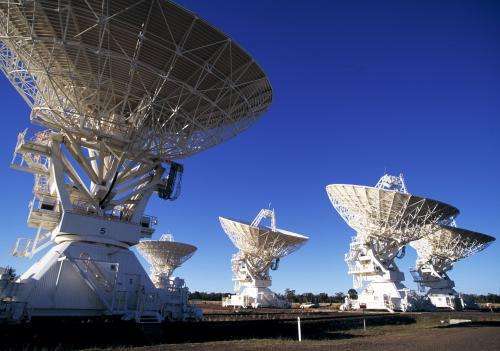 It boosted Australia's international standing in radio astronomy, enabling CSIRO to develop the Australian SKA Pathfinder in Western Australia and Australia to win the right to co-host the international Square Kilometre Array telescope.